Where Is It: Only a one hour drive from Miami, the Park is southwest of Florida’s largest city, near Homestead, FL. It protects the southern 20% of the original Everglades. It’s the largest subtropical wilderness in the US, and the largest wilderness of any kind east of the Mississippi River. The Birth: The movement to transform the Royal Palm State Park into a national park began in 1923. Ernest F Coe led a commission established by the Florida state legislature, and he strongly advocated that a 2,000,000 acre national park be established, which was opposed by many commercial interests in Flordida. Eventually, a national Park was authorized in 1934 … in the middle of the Great Depression. The resolution specified that no money be allocated for the project for at least 5 years. The park was eventually dedicated by President Harry Truman in 1947. Federal wildlife officials alarmed by an infestation of Burmese pythons in the Florida Everglades have tried radio tracking collars, a massive public hunt and even snake-sniffing dogs to control the invasive species. Now there’s talk of snaring the elusive pythons in specially designed traps.The U.S. Department of Agriculture received a patent in August for a trap that resembles a long, thin cage with a net at one end for the live capture of large, heavy snakes.Researchers say Burmese pythons regard the Everglades as an all-you-can-eat buffet, where native mammals are easy prey and the snakes have no natural predators. The population of Burmese pythons, which are native to India and other parts of Asia, likely developed from pets released into the wild, either intentionally or in the aftermath of Hurricane Andrew in 1992. The Everglades is comprised of more than 100 marsh species that live in water all or much of the year. Its most well-known wetland plant is sawgrass, a normally hearty grass-like species that has formed thousands of acres of marshes. Floating aquatic plants that dominate the waterscape include bladderwort, white water lily, spatterdock and maidencane. Living among these is one of the tiniest members of the Everglades plant community, periphyton algae. The base of food webs, algae floats in mats on or just below the water’s surface, and is found throughout the Everglades. In addition to aquatic ones, other plants in the Everglades live in wetland tree islands and upland hardwood hammocks that dot the landscape. Tree islands are small forests of trees and shrubs that have adapted to a wet environment. They provide an important home to the many mammals that live in the Everglades and are a site for wading and migratory bird rookeries. Tree islands generally are named after the trees that dominate them, with the most common the bay, willow and cypress. Animals: 36 federally protected animal species live in the park, and threats to their survival are grave. 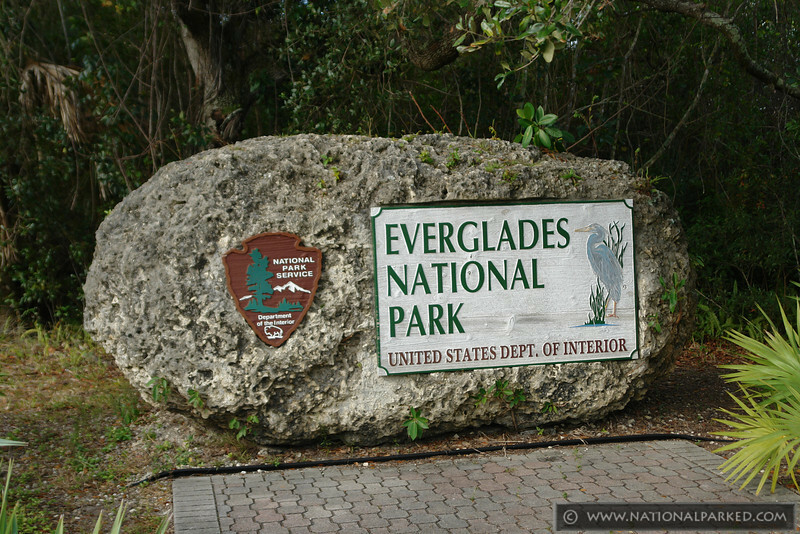 Unlike early national parks established to protect majestic scenery, Everglades National Park was established to preserve a portion of the vast Everglades ecosystem as wildlife habitat. The park is home to a vast array of animals that have adapted to a subtropical environment in which temperate climatic conditions, characteristic of latitudes to the north, merge with tropical Caribbean conditions. The winter dry season, which lasts from December to April, is the best time for wildlife viewing in the park. Weather conditions are generally pleasant during the winter and standing water levels are low, causing wildlife to congregate at central water locations. Shark Valley, the Anhinga Trail at Royal Palm, and Eco Pond in the Flamingo area are popular areas for viewing alligators, wading birds, and other wildlife. Boaters have additional access to wildlife viewing opportunities in Florida Bay and along the Gulf Coast. The best kept tour secret…..you can go out in the swampy area with a ranger for a 1 to 2 hour trek. 1 pm free ticket required. They only take the first 15 of the day to sign up. Can call or show up to see if there are any cancellations later in the day. REQUIRED: long pants And lace up shoes. You go out in almost knee to thigh high water – depending on how tall you are. Fees: Private vehicles are $10 for a seven-day pass. Staying There: There are 342 camping sites currently available. Campgrounds are available year-round. Reservations are made at 1-800-365-2267. Incredibly, fees are not charged June to August. Camping is half price for senior citizens, except for group sites. Less than 50 percent of the Everglades which existed prior to drainage attempts remains intact today. Populations of wading birds dwindled 90 percent from their original numbers between the 1940s and 2000s. The diversion of water to South Florida’s still-growing metropolitan areas is the Everglades National Park’s number one threat. In the 1950s and 1960s, 1,400 miles (2,300 km) of canals and levees, 150 gates and spillways, and 16 pumping stations were constructed to direct water toward cities and away from the Everglades. Low levels of water leave fish vulnerable to reptiles and birds, and as sawgrass dries it can burn or die off, which in turn kills apple snails and other animals that wading birds feed upon. Populations of birds fluctuate; in 2009, the South Florida Water Management District claimed wading birds across South Florida increased by 335 percent. However, following three years of higher numbers, The Miami Herald reported the same year that populations of wading birds within the park decreased by 29 percent. Over the last few years, staff members at Everglades National Park have experimented with ways to scare off flocks of vandals that lurk in parking lots every winter, sporadically defacing cars, trucks and boat trailers. They’ve tried yelling at them, squirting them with water, even dangling dead ones upside down in trees. But nothing has curbed the curious appetite that migrating vultures have developed for windshield wipers, sunroof seals and other rubber and vinyl vehicle parts. So this winter, the park is shifting to purely defensive tactics against the big birds, expanding a program that provides visitors at the most trouble-prone sites loaner “anti-vulture kits” consisting of blue plastic tarps and bungee cords. Airboat Tours. While many see the airboat as disruptive to the peaceful environment of the Everglades, there’s no denying that it’s a really fun way to experience the swamp! Many vendors provide airboat tours and holders of the Go Miami Card receive a free tour as part of their purchase. Shark Valley Tram Tour. Shark Valley Tram Tours (305-221-8455) offers two-hour guided tours of the paved loop trail that runs 15 miles through the Everglades from the Shark Valley Visitors Center. This is a great way to spot some wildlife and get a high-level perspective of the River of Grass from the Observation Tower at the loop’s most distant point. If you’re planning on visiting during the park’s busy season (December through April), be sure that you call ahead for a reservation. Shark Valley Observation Tower. The Observation Tower at Shark Valley is one of the highlights of the Everglades. On a clear day, you can see for miles around and observe wildlife in the park’s swampy habitat. The Observation Tower is located about 7 miles from the Shark Valley Visitor Center on a paved path that is not open to personal automobiles. You may access it by bicycle, on foot, or by riding the park’s tram tour. Gumbo Limbo Trail. The Gumbo Limbo Trail, accessible from the Royal Palm Visitor Center, offers a self-guided walk through a forest made up primarily of gumbo limbo trees. The trail is a short half-mile and is paved for easy access. Bicycles are not allowed on the trail but visitors in wheelchairs should have no difficulty navigating it. Anhinga Trail. The 0.8-mile Anhinga Trail is a self-guided walk through a sawgrass marsh on an easy, paved trail. Like the Gumbo Limbo trail, Anhinga is not open to bicycles but convenient for wheelchairs and strollers. It’s almost guaranteed that you’ll see some Everglades wildlife when you walk this trail. I’ve never been disappointed! Mahogany Hammock. The Mahoghany Hammock Trail is a 0.5 mile loop on a boardwalk through one of the Everglades’ unique ecosystems — the mahogany hammock. On this trail, you’ll see the largest living mahogany tree in the United States. Bicycle Tours. If you’d like to see the Everglades up close, a bicycle is one of the best ways to do so! You can either bring your own bicycle or rent one at the Shark Valley Visitors Center. Several trails in the park, including the Shark Valley Observation Tower Trail are open to bicycles. You may also choose to participate in a ranger-led bicycle tour — check at the Visitors Center for the daily schedule and more information. From the Facebook page for Everglades National Park. Photo Courtesy Glenn Gardner. Frome the Facebook page for Everglades National Park. Florida’s State butterfly, the Zebra Longwing, lays its eggs on the leaves of the passion vine (aka Passion Flower). These leaves contain toxins, but are eaten and tolerated by the caterpillars as they emerge. Ultimately the toxins make the adult butterflies poisonous if consumed by predators! From the Everglades NP Facebook page. Hibiscus grandiflorus, also known as the Swamp Rosemallow, grows in freshwater wetlands, but it can also tolerate brackish water. Look for it as you wander through the park, it blooms until mid to late September! From the Everglades NP Facebook page. The cry of the Limpkin is also the cry of the hippogriff in the film #HarryPotter and the Prisoner of Azkaban. From the Everglades NP Facebook page. From the Everglades NP Facebook page. Photo Courtesy of Glenn Gardner. From the Everglades NP Facebook page. The Eastern Diamondback Rattler is a swimmer … and does OK on land as well. From the Everglades NP Facebook page. Photo Courtesy of Paula Baxter, from the Everglades NP Facebook page. Swallow-tailed Kites winter in South America and arrive in Florida by mid- February. Nesting usually begins in Mid March. From the Everglades NP Facebook page. Black-necked stilt. From the Everglades NP Facebook page. The soft-shelled turtle can stay underwater … except for his protruding nose, which he breathes through. From the Everglades NP Facebook page. Barred Owl. From the Everglades National Park Facebook page. Royal Terns. From the Everglades NP Facebook page. Great Blue Heron. From the Everglades NP website. The Everglades National Park is also a World Heritage Site. Tweeted by the US Department of the Interior, 10/25/13. Tweeted by the US Department of the Interior, 12/15/13. A mangrove sunset over Oyster Bay. Tweeted by the US Department of the Interior, 12/30/13. I have visited twice and find it a really special place. I don’t like a lot of things that are found there but so happy that they do exist somewhere. My favorite is the alligator walking across the road, with the people standing a few feet away, taking pictures. I mean, what were they thinking? Don’t they know why we have zoom lenses? Everglades National Park is one of the most beautiful place to visit in South Florida, much less the planet. It’s important for us to all remember what’s at risk and how important is is for us to save the glades!